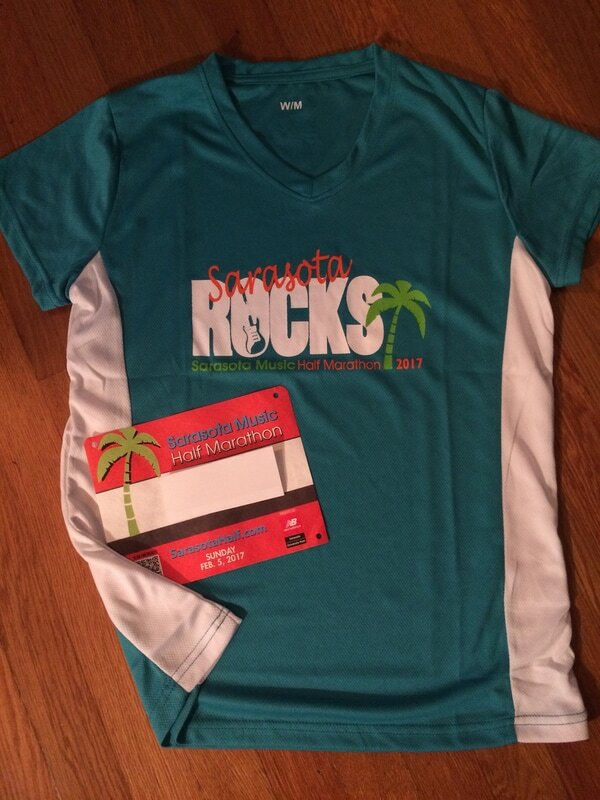 Sarasota's Music Half — really is a 13.1 Mile Moving Party! The Sarasota Music Half has only been around for three years, but it gets better and better every year. My favorite change was the new staggered release of corrals. It made the start smoother, and, eliminated the usual bottleneck that occurs as runners turn onto N. Tamiami Trail. The roped corrals and clear communication meant walkers were behind runners in the corrals. That was a good thing. Packet Pickup: Yes. 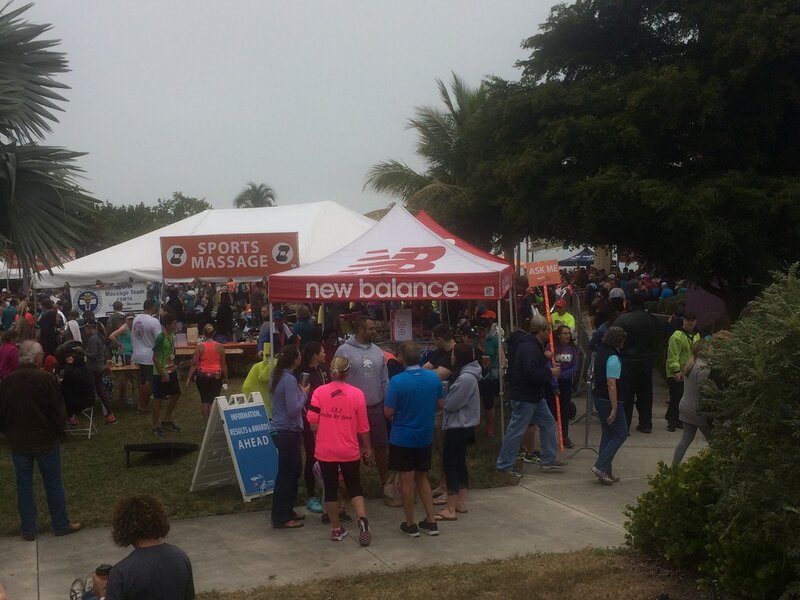 Packet pickup was at the New Balance store on Stickney Point Road on the Friday and Saturday before the race. Parking can be tricky in this busy area of town. There are two lots adjacent to the store. Pickup was an easy 3-part process; no bottlenecks. Received shirt and beer wristband. There was a tent sale in the parking lot. Race Course: The half marathon began and ended at Van Wezel Performing Arts Hall. We ran on city streets, over the John Ringling Causeway bridge, around St. Armands Circle, back over (and under) the bridge, past the Kissing Statue, along the waterfront, through historic neighborhoods, then Marie Selby Botanical Gardens, and finished by running Tamiami Trail back to Van Wezel. It's a very pretty course, even in the dense fog. I love the historic Cherokee Park neighborhood with its huge shade trees. Pacers: Yes. I saw pacers for 1:40 to 4:00 finish times. Aid Stations: Yes. Water and Gatorade every 1.5 miles. 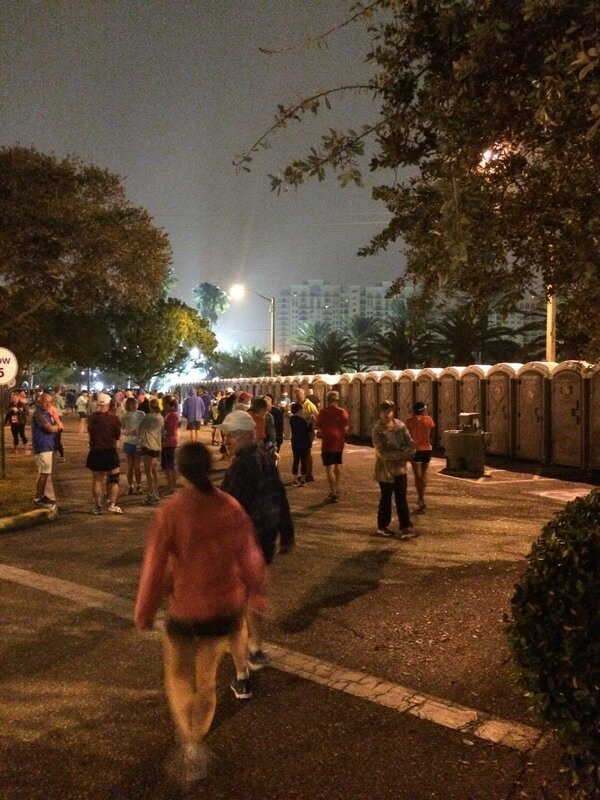 Port-o-lets at every aid station. There were Glukos Energy chews and gels served buffet-style at 7 miles. 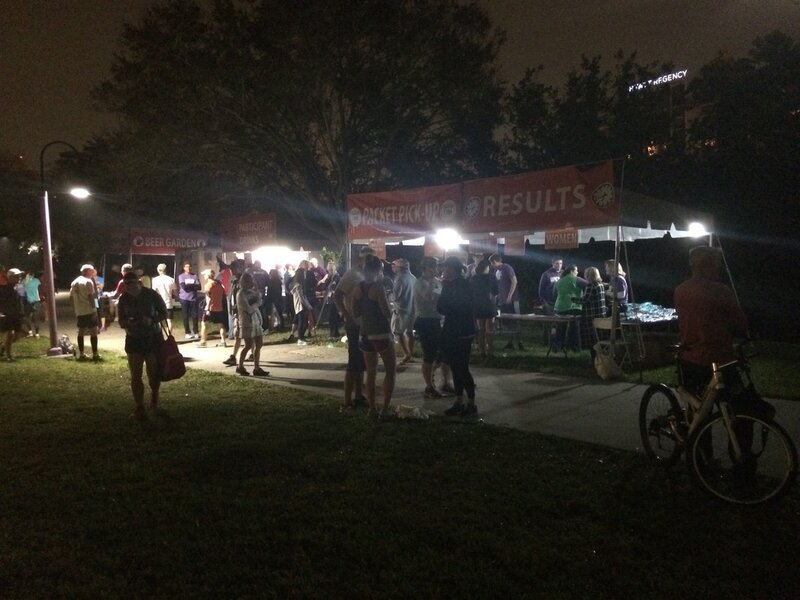 Runners passed the Glukos table twice, so there were two opportunities to grab fuel. Parking: Parking was FREE in the Van Wezel parking lot. Get there early, and you won't have any trouble getting a spot. There were more parking lots available a few blocks away. 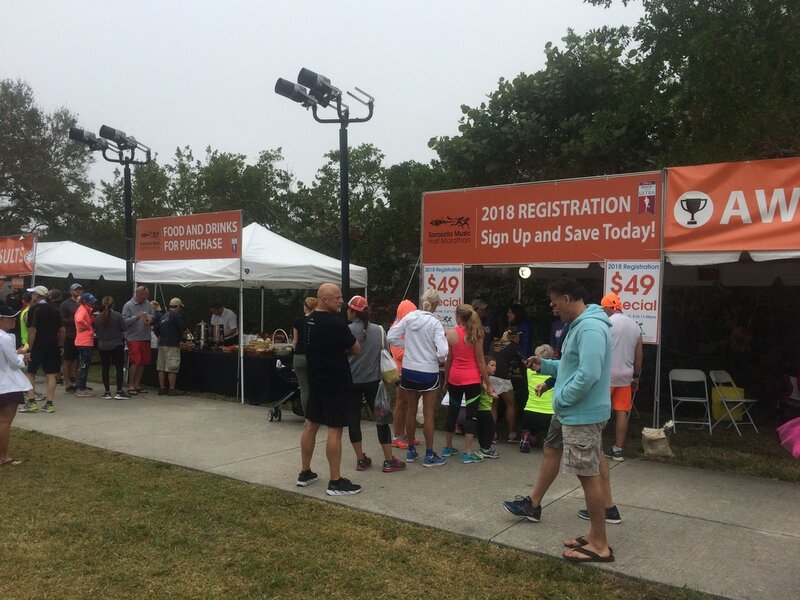 Special 2018 registration pricing available on race weekend was $49. The price was $60 from Feb. 6-12, 2017. SWAG (Stuff we all get): Short sleeve tech shirt. Nice weight and fun colors. There was a Virtual Goodie Bag with discount offers available from Feb. 4-9. Happy Surprise(s): Phone charging stations next to the starting corrals. Nice touch! ​Random volunteers (in volunteer shirts) all along the course who cheered runners. The priest who stood on the street splashing Holy Water on runners for the third year in a row. "Bless you, bless you!" "Thank you, Father!" 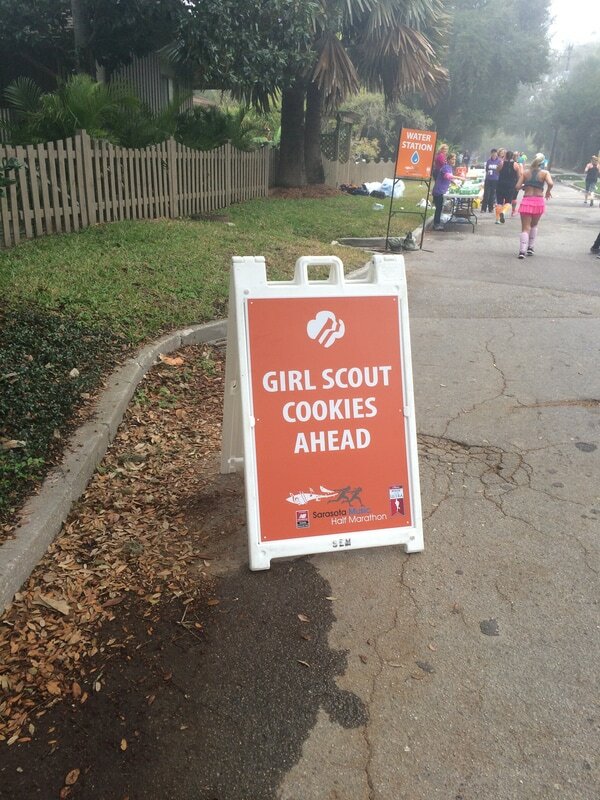 Girl Scout Cookies around mile 8. Yum! Marie Selby Botanical Gardens looked beautiful. I literally walked through there because I didn't want to miss anything. Post Race Festivities: Finishers received their medals, then headed to the picture spot, or down the stairs to the buffet. Negotiating the stairs from the parking lot to the south lawn looked difficult for some people. The four buffet lines moved quickly. 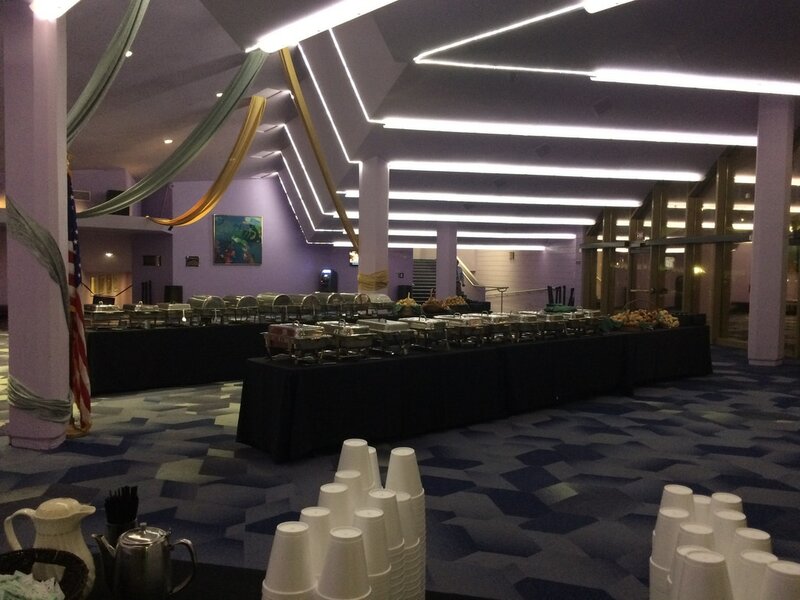 It was a feast: eggs, muffins, french toast, potatoes, sausage, bacon, omelet station, coffee, ice water, fruit. The beer tent had a short wait, but not bad. Light and dark beer were offered. There were vendors, massages for a fee, and results/registration tents. A live band played while runners relaxed on the lawn and patio. Photos: Yes. Finisher Pix was on the course, and at the finish line. 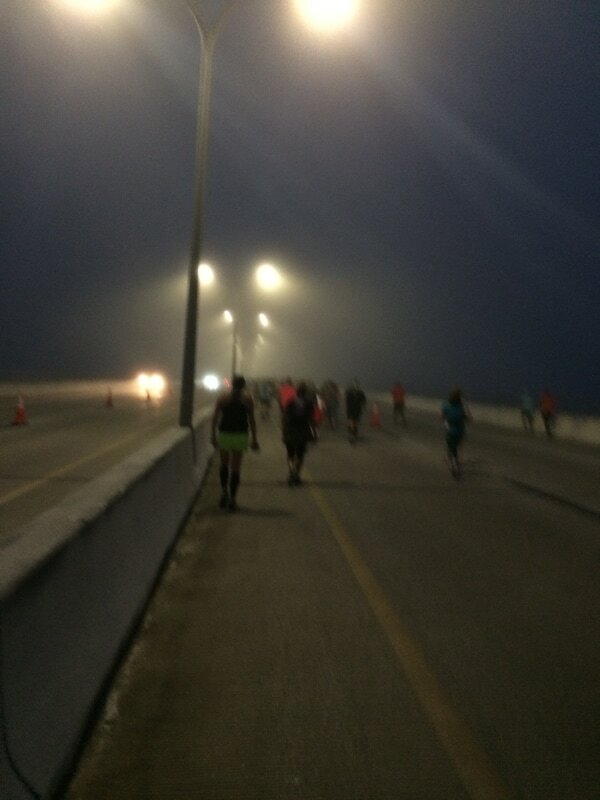 Runners received a link to pictures Tuesday morning. Pictures were available for a fee as digital downloads or prints. Awards: The awards ceremony was short and sweet. 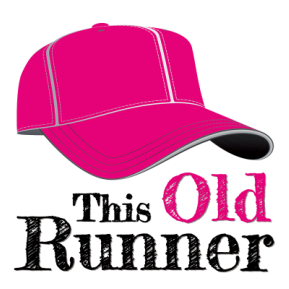 The top three overall male and female finishers, and the top male and female in the masters (40+), grandmasters (50+), senior grandmasters (60+), and the super grandmasters (70+) were awarded live. Awards for the other age groups were picked up at a tent next to the Main Stage without ceremony. Timing Chip: Yes. The chip was on the race bib. Digital displays were plentiful on the course, which was really nice. Race results were available immediately by scanning the QR code on your bib. Weather Report: February can be fickle when it comes to weather. This year was foggy and 50s. I was happy to wear my jacket over the bridge and after the race. 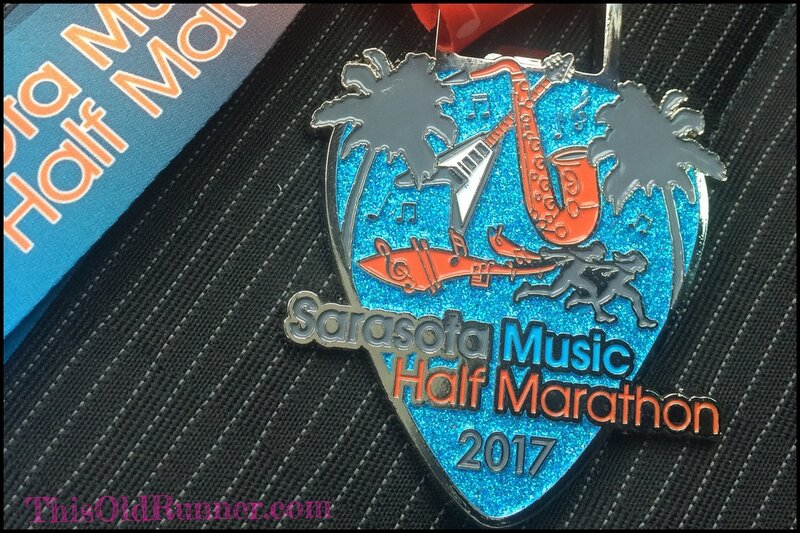 2017 finishers medal for the Sarasota Music Half Marathon was colorful and fun — and a bottle opener. 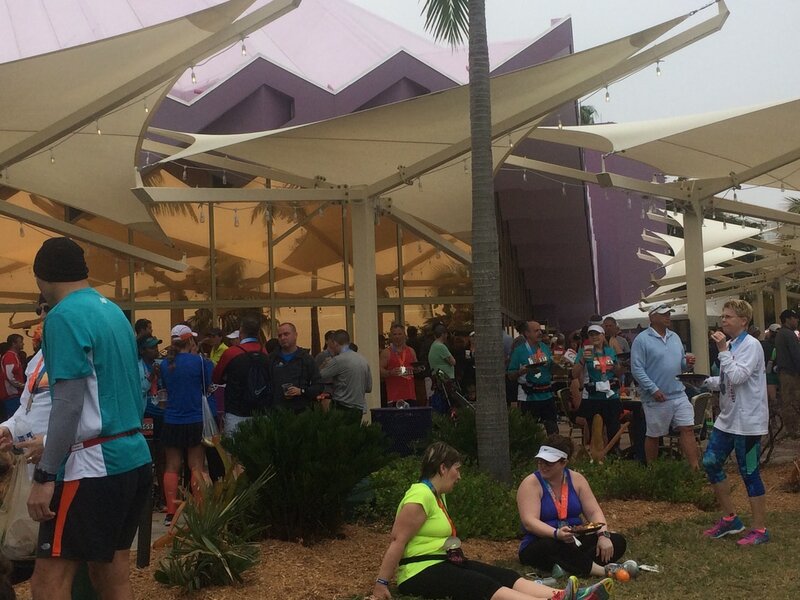 Sarasota Music Half marathon finishers relax on the south lawn at Van Wezel Performing Arts Hall. Since I wasn't properly trained, I decided to enjoy the scenery. I took lots of photos, ran a relaxed pace, and even walked through Selby Gardens. The only problem with going slow was that everyone around me was going slow, too. It was less motivating. However, there was a lot to like about this race at any pace. The bands sang everything from "Sweet Home Alabama" to "867-5309 Jenny" and one stop featured a mother/daughter duo. I love the way the residents embrace the race. Runners were welcomed with open arms. Spectators participated with signs, cheers, cowbells, drums and bubbles. Yes, bubbles. There were abundant volunteers. Need a cheer as you climb or descend the bridge? More water? Directions? Music? Mileage check? Thin Mint? Beer? Omelet? Yep, there were volunteers ready to deliver all that and more. Everything from parking to the post race party was easy thanks to volunteers all along the course. I don't know if it was the fog, or user error, but my tracking watch quit at 7 miles. I restarted, and it quit again after another mile. I restarted a third time and it stuck until the finish line. ​​My watch malfunction is my only complaint — and I'm really not complaining since it has nothing to do with the race. 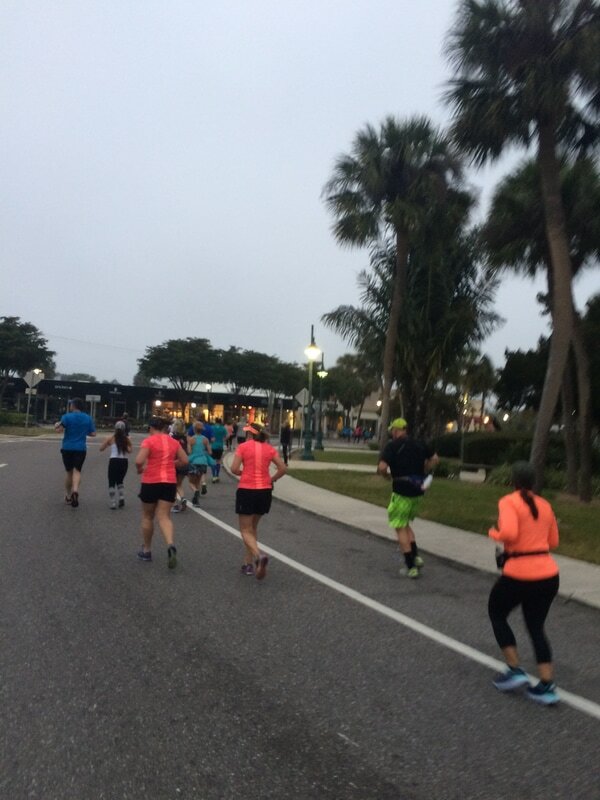 The Sarasota Music Half Marathon is a fun event. I recommend putting it on your bucket list. 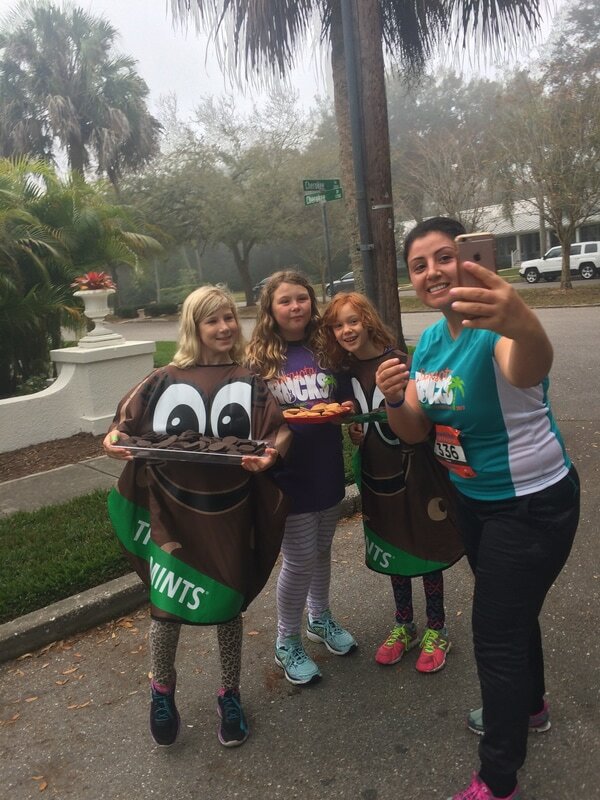 #SeenOnARun #SceneOnARun — Around mile 12, I saw a woman take off her shoes and run in her socks for the rest of the race.​ She wore her shoes like they were gloves.